Maybe you have been attending Second Baptist for a while, and have some questions about the inner workings of the church. Maybe you're new to the church and would like to simply meet one of our Pastors, and learn about ways you can get connected. Whatever stage you are at, we want to engage with you and help you gain a better understanding of who we are and why we're here. Join us for an informal coffee with Connie McNeill, Associate Pastor, Administration and Discipleship, and a few members of Second Baptist Church. Ask questions and chat about Second Baptist, how things work, and just anything you might want to know as you get more familiar with the family at Second. She can also schedule a time for you to meet with our Senior Pastor, Jason Edwards. RSVP here or call the church office at 781.2824. 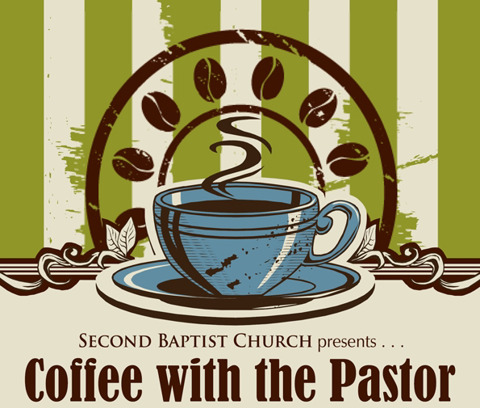 You've been invited to have coffee with the Pastor of Second Baptist Church. informal coffee and a chance to ask questions and chat about Second. family at Second. We would love the chance to get to know you too! Contact the church office to RSVP at 816-781-2824.